My secret blog assignment for this month's Secret Recipe Club was The Yummy Life, and that it definitely is! There were a lot of great recipes to choose from on Monica's blog. I browsed through the recipe archives on and off for about a week. Then, right before Administrative Professionals Day, I had a great idea that made it much easier to make a decision. Carolyn loved it, and I definitely did, too. Thanks for a great recipe, Monica! Spread almonds on a microwave-safe plate in a single layer. Microwave on high for 2-3 minutes, stirring after each minute. Arrange almonds in a single layer on a foil lined baking sheet. Combine butter, sugar, vanilla and salt in a saucepan. Cook over medium high heat, stirring frequently until butter is melted. Continue cooking for another 7-10 minutes, until candy turns light brown (it may start smoking slightly). 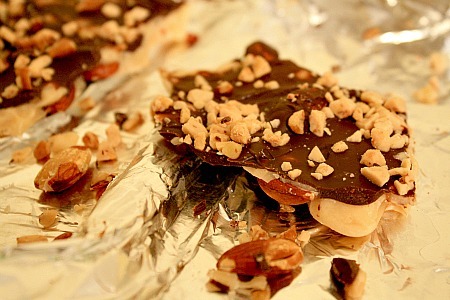 Immediately pour candy over almonds evenly. Sprinkle chocolate chips all over the candy. Wait one minute then spread chocolate until smooth. Sprinkle with pecans and Heath bits. Let cool then break into pieces. Store in refrigerator in a tightly covered container. Oh yum! That is one lucky office manager! Looks great! Mmm, love toffee. Sounds kind of like a theme for SRC this go-round. ;) I've seen 3 so far. Toffee is dangerous for me to have around. 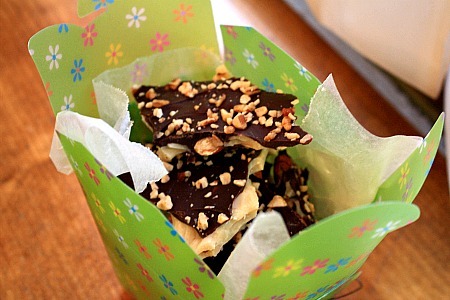 Homemade toffee is the best! How sweet of you! I'm sure Carolyn really appreciated it. Toffee really is the best. Here's to candy! I love homemade toffee. I made it once and it was so addicting Great SRC recipe. I literally want to eat this right now. Until it's all gone. I love toffee more than just about any other candy. Wonderful SRC choice! I've never made toffee but this recipe has been hooked. I must make it for a gathering soon. Mmmmm. A most try. Great choice for SRC! Looks wonderful! And the recipe is different than most I have made. My toffee loving hubby may get a treat! Yum, homemade toffee is always the best. I just adore toffee. This looks amazing.